Think Harley-Davidson, and a plethora of thoughts come to mind  big, flashy motorcycles, tonnes of chrome, burly bikers in leather jackets with tattooed arms, rock bands and a lot more. Harley-Davidson has never been just about the motorcycles. It has been about the whole experience of riding a Harley and enjoying your time on the motorcycle. Unlike most other motorcycles, you do not discuss a Harley's 0-100kmph times, top speeds or lap times. You talk about how different your Harley is from your peers', or where you plan to ride it next, and hope to enjoy the countryside at a leisurely pace. That's why, each time I straddle a Harley, I am never revving the nuts off it, accelerating hard to reach the destination or setting another time-speed-distance record (that's the usual me). Instead, I always get transformed into this calm, peace-loving biker who prefers cruising along, listening to the potato-potato drill from the V-twin mill sitting between my legs. Goes without saying then, that when we got to straddle the Harley-Davidson Super Glide Custom that H-D India launched at the Auto Expo recently as a CKD model, I took a day off, and set out on a ride that allowed me to soak in the feeling of riding a Harley, once again. One look at the Super Glide Custom and you know this is the real deal. I don't think Harleys get more authentic than this. Introduced more than four decades ago, the Super Glide Custom has been a perfect representation of the Harley brand with its classic styling and low seating. 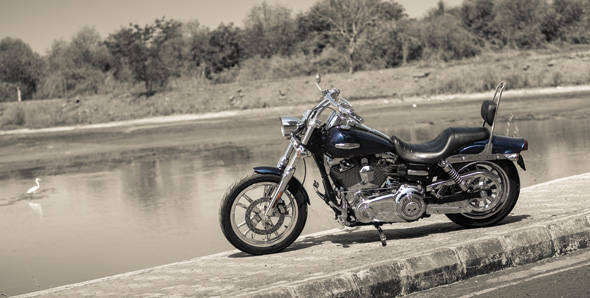 Harleys are best known for being huge, imposing motorcycles and this is one of the several reasons why they enjoy a cult status the world over. There are much bigger Harleys but it is indeed much larger than most motorcycles, or even some of its own siblings. I must admit here that I am a fan of the classic styling of the Super Glide Custom  the bike has its own identity with its chrome-laden front end, large, 19-inch wheel upfront, wide fuel tank and relaxed riding position. Harley-Davidson is perhaps the only manufacturer in the world, who tries to give every single motorcycle sold from its showrooms a distinct identity with its custom parts. The Harley-Davidson customization catalogue is virtually endless, and you cannot really ignore if you buy a Harley. And Harley-Davidson India is really trying to enlighten its existing customers and prospective buyers about this as well. As a result the Super Glide Custom shown at the Auto Expo sported loads of custom bits from end to end, and we got the very same bike for our road test. Hence, the Super Glide Custom you see on these pages is not what the stock bike looks like. This is the jazzed up version, and it did get me the stares wherever I took the motorcycle. The bike wore nice looking, shiny, chrome alloy wheels at both ends (the stock Super Glide gets spoked wheels), a flatter, more stylish looking handlebar as compared to the stock handlebar, which is more like the Fat Boy's handlebar. The tank wore skull-shaped fuel tank caps on both sides, though only the one on the right side can be opened for refueling. The left side skull incorporates a set of six LEDs in blue that work as a fuel gauge. The palm grips, footpegs and levers were all custom bits too, and so were the engine covers. The bike was even replete with a tall sissy bar for the pillion, but I think I was happier riding the bike alone. Everything on the motorcycle feels rock solid, virtually unbreakable. Each part of the motorcycle has a built to last feel. Now to the bike's credentials. The Super Glide Custom sports Harley-Davidson's air-cooled, Twin Cam 96 engine that displaces 1585cc. The guys at Milwaukee feel Harleys are all about torque  which the Super Glide Custom has loads of, all through its rev range. Maximum torque produced stands at 124Nm, produced at an unbelievably low 3250rpm. The engine feels rock solid too, and the moment you thumb the starter, it is quick to come to life, and the reverberating thump ensures heads turn around each time you do that. In fact, when riding the motorcycle, it is really hard to keep the throttle in a fixed position  the sound is so pleasing to the ear that you cannot help but keep modulating the throttle to vary the exhaust note! The engine visually seems to be vibrating like there's no tomorrow, but the vibration through the footpegs and the handlebar is negligible. In fact, as they say, it is part of the Harley 'experience'. A slick six-speed gearbox does duty on the Super Glide, and each shift comes with a massive clunk  as if every gearshift were trying to say "I have arrived." Gear changes are effected smoothly, even though the lever does demand some effort. The speedometer pod on the fuel tank incorporates a nice looking '6' that glows in bright green each time you slot into sixth, and is eye catching. Power delivery and throttle response are quick, and with humongous amounts of torque available right from the word go, the Super Glide is not shy of spinning its rear wheel if launched aggressively. For numbers, the Super Glide Custom achieved the 0-100kmph feat in 5.9 seconds. Okay, it isn't exactly a rocket, but consider this  the Super Glide's kerb weight is 313kg - for which the figure is impressive. On the top speed run, I managed to record 162kmph on the VBox (speedo reading at the time was 167kmph) before I backed off. This may not be the Fat Boy, but I guess in order to max out the Super Glide Custom you do need to be Mr Schwarzenneger. The performance tests were perhaps the only time I rode the Harley with the throttle pinned, rest of the time I was happier cruising, and so was the bike. In fact, the Super Glide is best when cruising between 100-120kmph. Go any faster, and you are not enjoying the ride. Given its mass, the Super Glide is not exactly easy to tip into corners, and demands some effort to be leaned. Once there, it really doesn't want to come up, but feels very composed and confident. The feel of leaning into a corner on such a large motorcycle is satisfying to say the least, and yes, cornering on a Harley is super fun! The Super Glide comes shod with Michelin Scorcher rubber at both ends that offer impressive levels of grip, with the front end wearing 100/90 section, while the rear end gets a 160/70 section tyre. However, the footpegs and low set exhausts do limit the bike's lean angles greatly, and on most occasions I found myself scraping the footpeg on the left, and the underside of the exhaust on the right side. This isn't scary at all like other motorcycles but does take you by surprise the first few times. Ride quality is on the stiffer side, and I know for a fact that Harley-Davidsons despise bad roads. I learnt that almost two years ago on the Harley-Davidson media ride in Rajasthan, but I must admit that roads in Mumbai are far worse. As a result, anything over crawling speeds on a bad road was torture on the Super Glide. Harleys are meant for super-smooth asphalt, and that's where they are enjoyed best. I did have my share of fun though, when I rode the bike to Pune, and had a whale of a time on the old NH4, which, thanks to the Mumbai-Pune Expressway is devoid of traffic. However, rear suspension has limited travel, and if you hit an undulation while going fast, there's a fair possibility of it bottoming out. However, the customization that had given the Super Glide the unique feel it had, and made it stand out wherever I parked it, turned into a bane after a few hours in the saddle. With the custom pegs and handlebar the riding position was apt for someone well over six feet in height. I am an inch less than six feet, and still had trouble keeping my feet on the footpegs, managing to just about feel comfortable holding the handlebar at the same time. Hence short rides weren't a problem, but when I set out for the longer ride, I was starting to complain. Reaching out to the gear lever became cumbersome after a couple of hours, and same was the case with the rear brake pedal. For that matter, the single disc brake upfront seemed to fade after a short time. So I had to reach out to use the rear brake, which offered a lot more bite. But just like Shumi, when it came to returning the Glide back, I was in two minds. I was totally in love with the motorcycle, but the customization on it had played spoil sport. However, I am certain that a stock Super Glide will be a lot more comfortable. If not, you can always choose what suits you from Harley-Davidson's endless catalogue. So I guess it's time I get myself a Harley-Davidson leather jacket, if not a tattoo, to make my next rendezvous with a Harley even more memorable and complete the experience!